Oswego, NY – Oswego Valley Insurance Agencies (OVIA) has announced that Amy Shaw has joined their Fulton office as a commercial lines manager, according to OVIA Treasurer Vern Drohan. 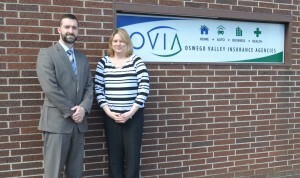 Amy Shaw is shown pictured recently with Oswego Valley Insurance Agencies (OVIA) Vice President Jim Poindexter. Shaw has joined the Fulton office of OVIA as a commercial lines manager. Ms. Shaw is a Fulton-native, and graduate of G. Ray Bodley High School. She will provide OVIA with 13 years of insurance experience working with both personal and commercial lines of insurance. Ms. Shaw most recently worked at other independent agencies in Fulton and Syracuse, New York. 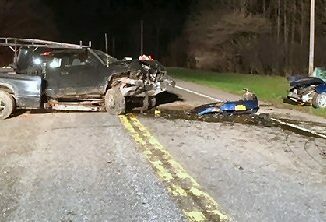 She can be reached at Oswego Valley Insurance Agencies (OVIA), 60 South First Street, Fulton, New York, at (315) 598-4278. OVIA was founded upon the merger of three longstanding independent insurance agencies that have provided services to their communities since the late 1800’s. Dowd & Harrington, Inc., Streeter & Van Sanford, Inc., and the Hollister Agency merged to form Oswego Valley Insurance Agencies. Today, OVIA operates five offices in Oswego and Onondaga Counties including Oswego, Fulton, Phoenix, Brewerton, Mexico, and Clayton. For more information on OVIA visit www.insureit.com.